It goes without saying, but sanitary washrooms are a must in any work place. This is more important if your customers visit your work place or when co-workers share the toilets. When this happens, it becomes essential to maintain the highest level of cleanliness and a pleasant environment. No one loves to walk in an unpleasant mess in the stall or even worse. With that in mind here are some tips that you can follow to ensure that there is a high maintenance of cleanliness and keep it in great condition. Just like it’s a bad habit to drop the toilet papers on the floor or leaving the puddles on the sink at home washrooms, it’s also unacceptable to do the same in the office. To show the highest respect to your co-workers and customers, you have to treat the washrooms as if they were your own. Treating everything in the washrooms with care and high maintenance is very essential at any work place. This means, always flushing the toilet, discarding the trash in the washrooms and in case you have spilt any water accidentally in the room, always clean up. It is very crucial for co-workers to set up some ground rules and for management to make sure that these rules are followed. Instead of setting up routines for co-workers for washroom upkeep, it is more advisable to hire a company that specializes on this kind of tasks. 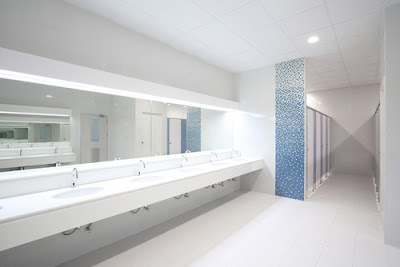 These companies can handle all the necessary steps to keep the washrooms clean, supplied with stock and therefore helping you maintain your company image. Your workers and employees should not be juggling between their primary tasks and toilet duties. Some of them may not take these tasks easily as they may feel diminished. It’s advisable to let the employees or the clients to notify the department responsible with sanitary in case of any issues arising from the washrooms. A good example would be a broken sink. This may cause spills that may results in slip ups or the washroom being wet all the time. It’s always important to encourage employees to clean up after themselves. Keeping the tissue papers always available and in orderly manner, the soap dispenser full and clean and the paper towels always available are some of the policies that employees need to be made aware of. 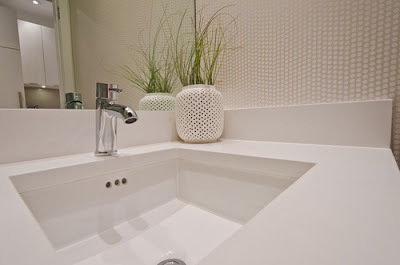 Having an air freshener system that creates a pleasant environment is very crucial in washrooms. A covered trash can does create this image of your organization, so having it is mandatory. Some items like light bulbs and water system should be checked frequently because they are a life line of any washroom. 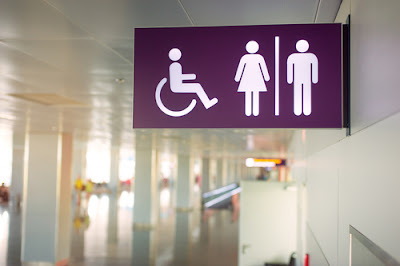 The management has to keep in mind that at one point, people with disabilities may work or visit their office washrooms. It may become increasingly impossible for someone with disabilities to use the normal washrooms with ease. A facility for people with disability should be accessible and should be in accordance with the requirements stipulated under BCA’s code of accessibility in the built environment. People with Ostomates, these are people who have had a surgical operation to create a body opening that helps to discharge body wastes. Just like they are being installed in airport washrooms, it would be advisable to have them installed in the accessible washrooms. There should also be at least one baby seat in the washroom. To indicate the sign of a baby seat, a signage should be hanged on the cubicle. At any point, a client may visit your organization and has an infant. Therefore having a diaper changing station is required. One would suffice. Having an ineffective ventilation system can make the washroom unbearable, even if the design is fantastic. The system should be designed in a way that, it dispels the air directly outdoors so that it doesn’t cause any nuisance to the neighboring work stations. The best system is always mechanical system. If the company decides to go with the system, there should be a cross ventilation, whereby there air exchange happens at least 15 times in an hour. There have been cases whereby employees conduct smoking in the washrooms. If this is permissible by the organization, at least design a smoking zone within the washroom with a very effective ventilation system. This is where things get tricky. Setting up a poor drainage system can have devastating effects on your washrooms. There have been cases where toilets keep flooding due to the blockage. It doesn’t matter whether you have hired the best cleaning company, but if your drainage system was installed poorly, then you are in for a long and rough drive. Always consult professionals who will check whether the system was installed well. This may end up saving you both your fortune and your reputation. It’s common sense. The more number of washrooms you have, the easier accessible they will be. You cannot have an organization of 20-100 workers and expect them to share 4-5 toilets. Let’s look at this in a different perspective. The fewer the washrooms, the longer the que and the waiting time. This will also make it impossible for the cleaners to actually do their job at the same time as the workers are using the washroom. But if the number can be increased, whereby, as the workers use certain washrooms, the cleaners may continue working on the other washrooms. It’s advisable to include more than one urinal in the washrooms, more sinks and hand driers. Keep in mind, if workers waste a lot of their time queuing to use the washroom, it creates an unpleasant environment and the organization gets a wrong image and reputation. Being motivated can increase both production and results. Holding seminars that highlights the dangers of having unclean and unpleasant washrooms frequently can greatly improve the sanitary conditions of your washrooms. We have had cases of slip ups in the washrooms due to careless spills. These slip ups have ended up with devastating injuries. It’s very essential for a company to emphasize and make their employees become aware of such accidents happening in the washrooms. This will help the company or organization avoid some issues like law suits that may end badly for the organization. It should be clearly stated by the management that, each employee should be responsible and act in accordance to the standards and regulations of the organization. Sharing washrooms with co-workers doesn’t have to be unpleasant at all. To ensure that everything runs smoothly, contact your local cleaning professionals or you County Office in charge of sanitary to get all the information required to maintain that sanitary condition of your washrooms.